Good News again! May 28th, 2010 WordPress Blog announced that WordPress version 3.0 Release Candidate 1 is available for downloads and tests. Thus, we can hope together with WordPress development team that almost all things for WordPress 3.0 are done already: new features developments are finished, the most bugs are fixed, etc., etc., … Just final tests and not catched bugs hunting are left :). 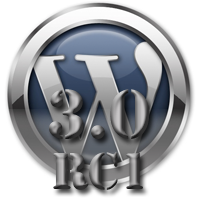 What noticable things differs WordPress 3.0 RC1 from WordPress 3.0 Beta 2? One important difference is that “Custom menus are finished!”. Yes, they did it, and we have some new staff to see and play at the Menus section. 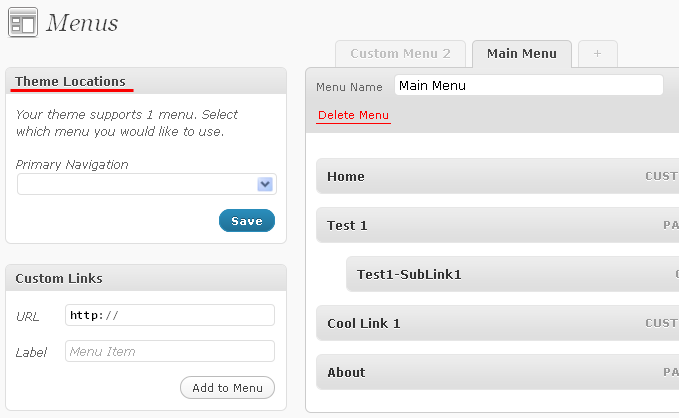 We had detailed talk already about new WordPress custom menu system at the WordPress 3.0 Built-in Menu System post. Let’s see what’s new we have there now with latest WordPress 3.0 RC1 version. Do you remember that if you built more than one menu under WordPress 3.0 Beta 2 version and your theme (as new WorPress 3.0 default Twenty Ten theme) has one menu slot only, it uses and shows menu with the lowest Id only, that is menu you created first? That limitation is gone away. We have Theme Locations box now and can select what menu to use for what location. /* Our navigation menu. If one isn't filled out, wp_nav_menu falls back to wp_page_menu. Put your attention on the wp_nav_menu() function call and its theme_location parameter with value primary. Conclusion: your theme could have many menu locations according to the general quant of wp_nav_menu() function calls with different theme_location parameter values. Another enhancement in the custom menu system is the Menus auto add pages feature. Just turn on the correspondent Menus auto add pages checkbox to enable this mechanism for selected menu and all new created first level pages will be included into that menu automatically. So you can manage now into what menu your new pages will be added automatically. What’s next? Let’s go! Download WordPress 3.0 Release Candidate (RC1) from this link, setup it at test environment if it is available for you and make the thorough tests. With it’s really huge, smart, creative and robust community help WordPress could go to the 3.0 release stage very fast. When we will get WordPress 3.0 release? How much time is left to that event, days, weeks, or (I’m sure it’s impossible) months? I think that we will get WordPress 3.0 release during June 2010. What do you think? This entry was posted on Monday, May 31st, 2010 at 12:07	and is filed under WordPress. You can follow any responses to this entry through the RSS 2.0 feed. You can skip to the end and leave a response. Pinging is currently not allowed.